The Core Pathology is a self funding, CPA accredited department and is a fee-for-service facility providing Histopathology services to members of Queen Mary University of London and other academic institutes, as well as providing a diagnostic service to the private sector (for more details on the diagnostic service please see tab). Users of the service can select from a number of options to enable them to work to their time and budgetary commitments. Have the entire project completed by the Pathology Core Facility. Have the Pathology Core Facility cut the sections for staining in the users laboratory. It is advised that Users come to discuss their project with us as you may wish to use a combination of any of the options above. The department is experienced with human and animal tissue but has had some experience in processing and cutting of different types of material like silk and leather (we will have a go at anything). There is archival animal and human tissue available as control material for optimisations. The current staff are all Biomedical Scientists, specialists in histological techniques and are HCPC registered. They can provide the technical expertise and resources to cover the full range of histopathological techniques. Tuition is also offered in all aspects of histopathological technique as well as supervision and use of facilities once trained. It is also able to advise on costing when submitting grants that contain a histopathology element and we recommend that prospective users visit the facility when planning their grant applications. All work for the Core Pathology Department is now requested through an online ordering system hosted by I-Labs. The link below will take you to the relevant site. If you are a internal user then you will be able to log on with your QMUL ID; if you are a external user then you will be required to set up an account and I-Labs will issue you with log in details. The Core Pathology facility is accredited with Clinical Pathology Accreditation (Ref. No. 2778), HTA licensed and currently processes over 4000 surgical cases. We have a full team of Consultant Histopathologists covering all specialities as well as an experienced and efficient team of Biomedical Scientists. All the biomedical scientists are HCPC registered and participate in CPD activities. Turnaround times for most cases are 24-48 hours. More complex specimens, and those specimens requiring additional testing, may take longer to produce the final report. 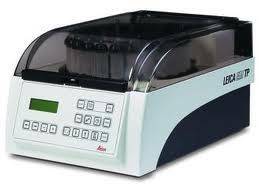 Some additional testing may be carried out by referral CPA accredited laboratories. We can provide a full or bespoke service, tailored to your histopathology needs. The EM service at the Cellular Pathology Department of the Royal London Hospital is headed by Mr. Graham McPhail who has many years of EM experience and is regarded as an expert in his field. Where suitable the processing is carried out on our Leica EM tissue processor. The processor is designed for EM resin processing, when this is not suitable we will carry out the processing by hand. We also cut both ultra-thin and semi-thin sections and stain them for EM imaging. We will also image the sections for you on the EM microscope based at NanoVision and provide digital images on a CD. We can either do this for you, or you can attend the session and choose the areas you would like imaging. 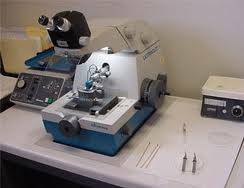 Training on the use of the EM microscope can also be given. This a fee-for-service set up and work can be booked through our online ordering system I-Labs. The link below will take you to the relevant site. If you are a internal user then you will be able to log on with your QMUL ID; if you are a external user then you will be required to set up an account and I-Labs will issue you with log in details. The slide scanning service enables researchers to scan whole slides as digital images. The equipment used is a state of the art Hamamatsu whole slide scanner with free software. This can scan a regular histology slide at either x20 or x40 objective lens on a standard light microscope. The scan time varies with tissue size, however, as a rough guide, a 1x1cm piece of tissue at x20 will take under 2 minutes and x40 will take under 4 minutes. Annotation and measurement is possible. However no analysis software is available. Apart from your samples, you will need a memory stick / external hard drive with at least 250mb space per slide scanned is advisable. As this service is part of the Core Pathology unit, the upkeep and maintenance of the equipment needs to be covered as we are a self funding department. The prices can be found on our online ordering syetm I-Labs. The link below will take you to the relevant site. If you are a internal user then you will be able to log on with your QMUL ID; if you are a external user then you will be required to set up an account and I-Labs will issue you with log in details. The course is run in collaboration with Barts Health and is organised by Dr M Calaminici, Dr H Rizvi and Dr T Butler. The course is designed for senior trainees in histopatholgoy and haematology, consultants with a special interest in haematopatholgoy and Reserchers who are specialising in these fields. Diana, c. et al., RHBDF2 Mutations Are Associated with Tylosis a Familial Esophageal Cancer Syndrome. The american journal of Human Genetics 90, 340-346, Feburary 10, 2012. Powell, N., et al., The Transcription Factor T-bet Regulates Intestinal Inflammation Mediated by Interleukin-7 Receptor Innate Lymphoid Cells. Immunity 37, 674-684, October 19, 2012. J Broad et al., Regional- and agonist- dependent facilitation of human neurogastrointestinal functions by motilin receptor agonists. British Journal of Pharmacology (2012) 167, 763-774. William Harvey Day : Robert, CD., et al., Inbuilt mechanisms for overcoming functional problems inherent in hepatic microlobular structure. Timmins, LH., et al., Investigation into the mechanical and cytoskeletal protein inhomogeneity in bovine carotid arteries. Biomedical Engineering Conference at Imperial College London 2008. Wolk M., et al., Development of fetal haemoglobin-blood cells (F cells) within colorectal tumour tissues. J. Clin. Pathol. 2006; 59:598-602. Price. KM., Subcellular functional specificity of dynein-dynactin complex subunits – normal distribution and distrubances in neurodegenerative disease. Path. Soc. Jan 2006. Parachaney, P., et al., The effect of intrauterine growth restriction on the elasticity of the thoracic aorta in young rats. William Harvey Day, October 2005 and CISM Research Day June 2005. Price. KM., Subcellular functional specificity of dynein-dynactin complex subunits – normal distribution and disturbances in neurodegenerative disease. William Harvey Day October 2005 and ALS/MND meeting Dublin December 2005. Roger, F., et al., Abnormal expression of pRb, p16, and cyclin D1 in gastric adenocarcinoma and its lymph node metastases: Relationship with pathological features and survival. Hum. Pathol. 2003, December;34(12):1276-82. The Core Pathology Department is happy to annouce we have a new online ordering system for our research work, called I-Labs. The system allows you to book bench space to carry out immunohistochemistry, time on the sldie scanner and request all other services. The system will generate quotes which you are able to download as PDFs and will help us and yourself to keep track of work flow and expenditure. The link below will take you to the relevant site. If you are a internal user then you will be able to log on with your QMUL ID; if you are a external user then you will be required to set up an account and I-Labs will issue you with log in details. We are happy to announce that our slide scanner is now capable of scanning Fluroscence Stained slides. For more details please contact the lab. Our Publications and Courses tabs have been updated. We are happy to annouce that all staff have undertaken the 'Good Laboratory Practice' (GCP) course which meets the requirements for laboratory staff to participate and carry out work for Clinical Trials. We have just received confirmation that the department has passed its latest CPA inspection and maintains its accreditation. The team has done a brilliant job and we only received 6 non critical non-conformities which were only minor document changes. Once again good job guys! In 2006 the Core Pathology department participated in the Whitaker International Program (http://www.whitaker.org/grants/overview). This involves joint research projects between students from the USA and host laboratories around the world. The project title was 'Arterial Elasticity: Histological and Histochemical Analysis' and was headed by Professor Steve Greenwald (Pathology Group) in collaboration with Texas A&M Univeristy. Dr. Luke Timmins (http://www.whitaker.org/fsdirectory/info/29) was the lucky student who spent a year in our department and was a major asset, not just academically but he also became a member of the team and formed close friendships with its members. He now has a post doc position at The University of Atlanta and we continue to have close ties, which has helped our department braoden our academic contacts and research interests. The department benefited considerably from this program, so as they have now updated their website, I thought I would share this information in case it is of interest to other groups. The department was asked to participate in a documentary on BBC 1 called 'Death Unexplained'. This is due to the work we carry out for multiple Coroners around London. The documentary follows Coroners' cases from the start to end covering all aspects including the laboratory tests. Please check out the program and see what else we get up to.